Preparations are underway at The Westin Resort Nusa Dua, Bali for yet another family-style festive season with a well-balanced program of activities and versatile dining experiences. There is something for everyone this year with family-friendly dinners and special activities just for kids. The celebrations will start in a big way on Christmas Eve with a smart cocktail party at the Lobby Bar & Lounge. This gathering will invite in-house guests to connect and embrace the spirt of the season over themed drinks and light bites. A heartfelt performance from a local children’s choir will set the mood and Santa Claus will be on hand to greet the little ones. A delightful dinner on Christmas Eve will also be served under the stars in a refreshing poolside setting with great food and entertainment for the entire family to enjoy. Appetites will be tempted by festive favorites and succulent seafood to the sounds of live music and a special fire dance performance. Engaging activities will keep youngsters amused during the evening with fun games and novelties. As an alternative dining option, Hamabe will be serving authentic Japanese cuisine with unlimited sushi, sashimi, teppanyaki and robatayaki tasting dishes. A la carte menus will also be available at Ikan overlooking the resort’s famed stretch of white sand beach, while Prego will ensure a flavorful Italian dining experience. For after-dark relaxation, the Beach Lounge will be open until midnight for adults only to enjoy drinks, shisha and chill-out tunes. On Christmas Day, children will have their very own celebration starting off with a fun breakfast party in the balloon-filled ambience of Nusantara Room. There’ll be cool games, a magic show, a visit from Santa and activities supervised by the team from the Westin Family Kids Club. Parents are welcome to come along and join in the merriment from 8.00 am to 10.00. Christmas Day Brunch at Prego promises to be a lively affair featuring an extensive buffet of tempting dishes including a carving station that will have everyone coming back for more. There will be lots of carnival-style activities going on in the adjacent garden with balloons, magic tricks and photo opportunities. Santa is also expected to come by with his sack filled with treats. Guests have a range of different dinner options to choose from on Christmas Day. Hamabe will be pleasing palates with Japanese specialty dishes and an a la carte menu will be available at Prego. For something a little more refined, Ikan will present succulent seafood and other local flavors in an uplifting setting overlooking the gentle waters of the Indian Ocean. 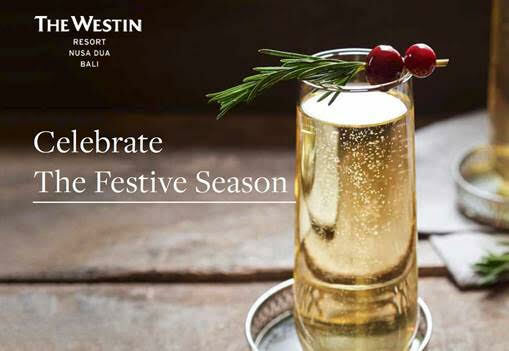 New Year’s Eve at The Westin Resort Nusa Dua, Bali will welcome guests to eat, drink and be merry with an ‘All Around The World Buffet’ paired with live music and entertainment. Prego will also be putting on a sumptuous feast, while Ikan will be going all out to celebrate the last day of the year with a Festive Starlight Dinner by the beach. To ring in the New Year in true style, Beach Lounge will be hosting an upbeat party complete with pulsating DJ music and dancing on the sand. There will be a midnight countdown while watching the firework along the coast line and the revelry will continue into the early hours. Exclusive room package over the festive season come with an array of added-value entitlements. These include daily SuperFoodsRX breakfast, dinner on Christmas Eve and dinner on New Year’s Eve for up to two adults and two children (under three years of age). Other benefits such as full internet coverage, access to Westin Family Kids Club and WestinWORKOUT® Fitness Studio are all part of the deal. Prices start from just IDR 2,500,000++ per room/per night for a minimum stay of three nights. Terms and conditions apply.